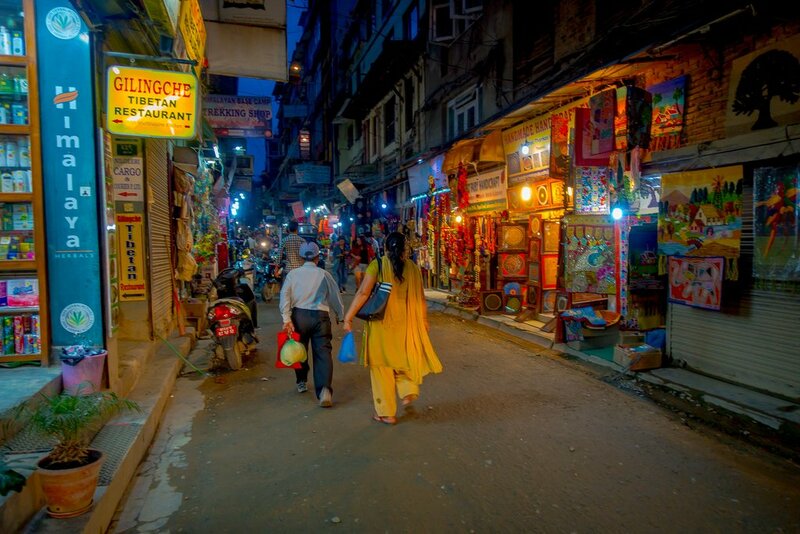 You will be met upon arrival in Kathmandu and transferred to your hotel. Depending on your arrival time, there may be time for some exploring in the afternoon/evening. 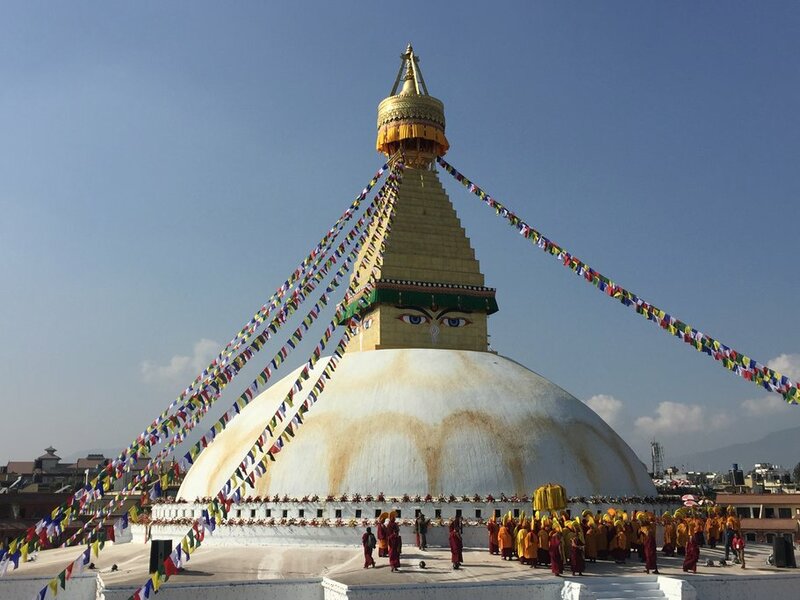 You will be staying at Boudhanath, a neighborhood of Kathmandu that is home to many Tibetans, and in the evening you can walk around the great Boudhanath Stupa. 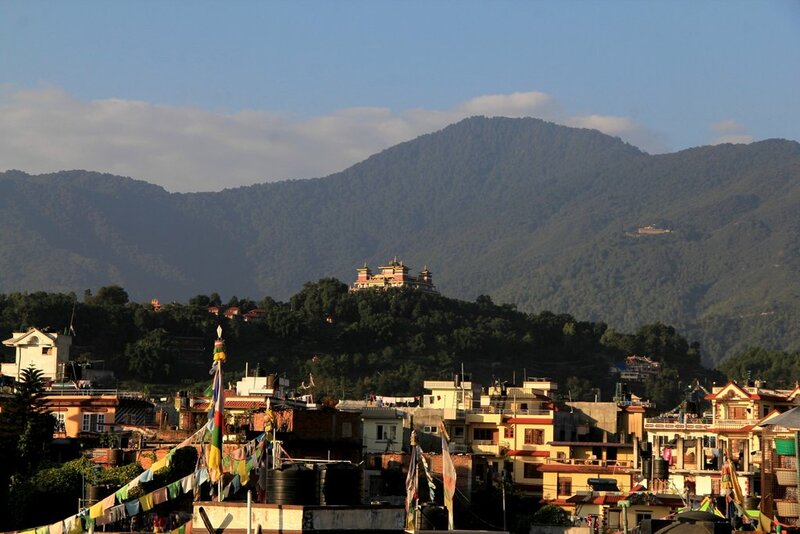 Today, explore the most interesting sights of Kathmandu. Spend the morning on a sightseeing tour of Patan Durbar Square (the old royal palace complex) and the holy Buddhist stupa of Swayambunath—also referred to as the ‘Monkey Temple.' In the afternoon, explore the Hindu temple of Pashupatinath. A spectacular afternoon flight takes you to Mahendra Airport in Nepalgunj, the largest city on the steamy Terai, the flat border region between Nepal and India. The drive to the hotel passes through an old village, and you'll get the chance to experience the 'old' Nepal. Stay the night in an air-conditioned hotel and head to bed—you'll have an early wake-up call the following morning. Take the early morning flight 135 miles (218 km.) north to Simikot, the district headquarters of Humla. The town is situated on a ridge overlooking the Humla Karnali River. The flight is spectacular, cruising just over the tops of a mass of snow-covered peaks. If the flight is on time, arrive before lunch and be met by your friendly trekking crew. 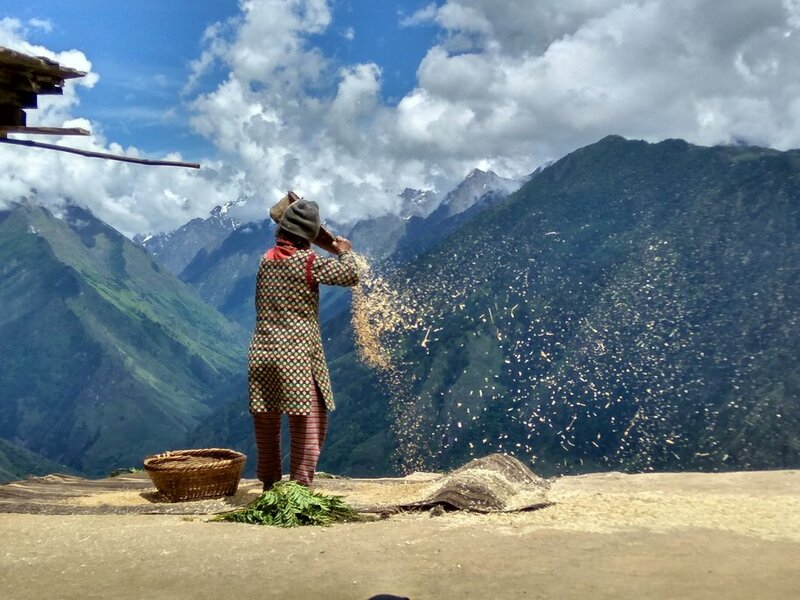 Simikot is an atmospheric village, a mix of local Humla and Tibetan culture and provides endless fascinating opportunities for exploring. It's likely that you will feel the jump in altitude, so take it easy today, making sure you drink plenty of water. After an early lunch, slowly head towards the Nyinba Valley. 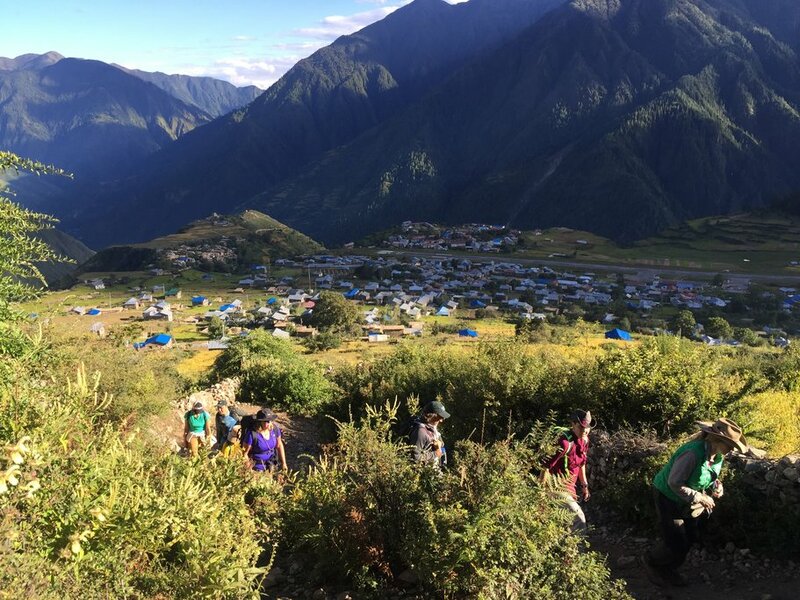 After about 1.5 hours of gradual climbing, reach some prayer flags and a small school. This place is called Limbuk (10,587 ft. / 3,227 m.). Then, descend down towards Nyinba village for another 15 minutes. Buraunse (10,842 ft. / 3,000 m.) is a Tibetan Buddhist village, surrounded by fields of barley and millet. There are a few homestays here. 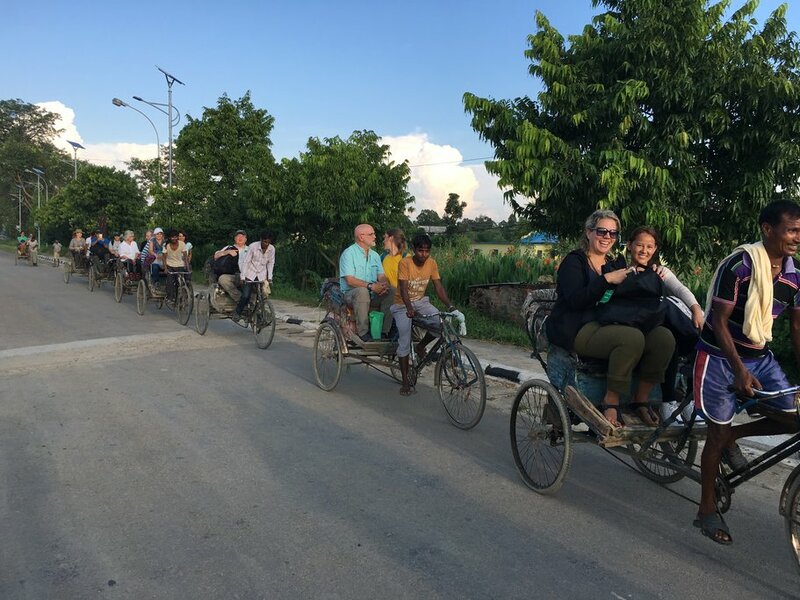 Staying in a homestay provides a wonderful opportunity to openly and authentically engage with the local people and to learn about local life. Leave Buraunse and head downhill to the Ghatte Khola (river), which is crossed by a wooden bridge. 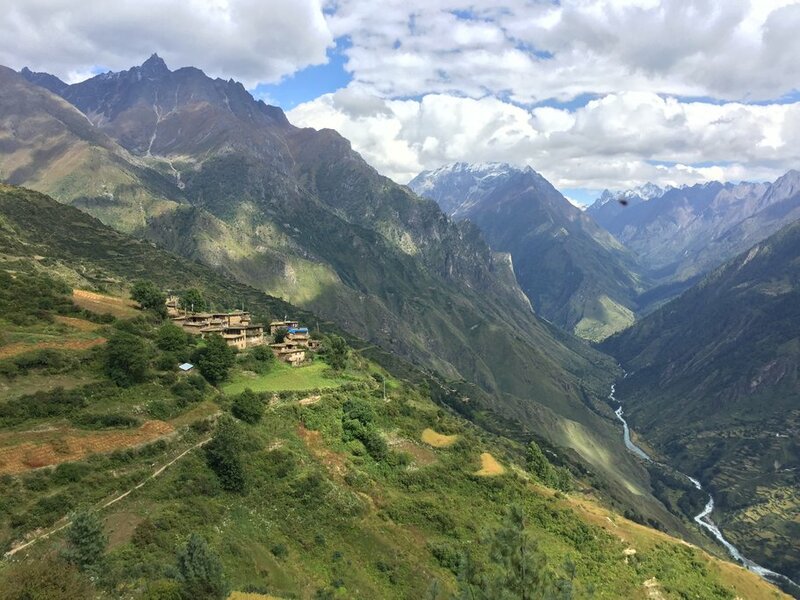 From this point, the trail climbs gradually and you will pass the village of Langdu. It is easy walking through this beautiful and varied countryside. 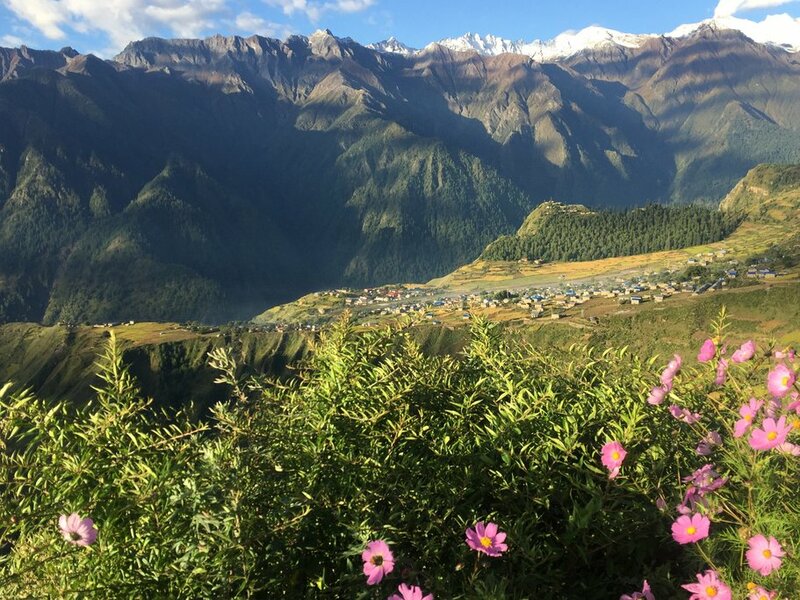 Here, terraced hills stretch out in front and the snow-capped peaks of Changla Himal (21,532 ft. / 6,563 m.) and Crystal Mountain can be seen in the distance. On this route, pass many small Buddhist stupas and mani walls, a constant reminder of the timeless spiritual connection that still exists here. A mani wall is a low wall with flat stones, each stone carved with a Buddhist mantra. The most famous mantra is “Om Mani Padme Hum”, which roughly means “Blessed is the jewel in the lotus”. This mantra honors Avalokiteswara, the Boddhisatva (an enlightened being who decides to return to earth to help others) of compassion. 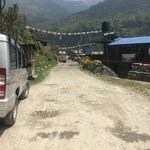 After about two hours, enter the village of Thorpa (10,433 ft. / 3,180 m.) through a beautifully painted kangni (gate stupa). The kangni protects the village from bad spirits entering. Thorpa makes for a good lunch stop. Shortly after Thorpa, pass a small site called Bhibuck Cave (a meditation cave), which contains a huge prayer wheel. Inside the wheel, the mantra “Om Mani Padme Hum” is written thousands of times. Turning the wheel is said to release the mantra into the universe a thousand times over. Continue on to the village of Hutick (10,636 ft. / 3,242 m.). From here it is approximately a one-hour gradual climbing to the village of Nimatang (10,908 ft. / 3,325 m.), your destination. Leave the village behind and walk through beautiful pine forests, surrounded by the scent of juniper trees and bushes. The trail goes down for about half an hour to the Ghatte Khola, which you cross using an iron bridge. From here, the long climb to Raling Gompa starts. It is a beautiful small trail, climbing up gradually through the forest. The route allows spectacular views of the entire Nyinba Valley. To the southwest is Mt. Ribuche; the Changla Range sits towards the southeast and Mt. Pungrikar (Panchauli) towards the north. A pole with prayer flags high above is your aim. It takes about 1.5 hours to reach. This place is called Tokra (11,637 ft. / 3,547 m.). Here, many Nyinba people camp during the annual Saga Dawa Festival in May/June. It marks the birthday, enlightenment, and passing of Sakyamuni Buddha. During the festival, many rituals, ceremonies, and masked dances take place. 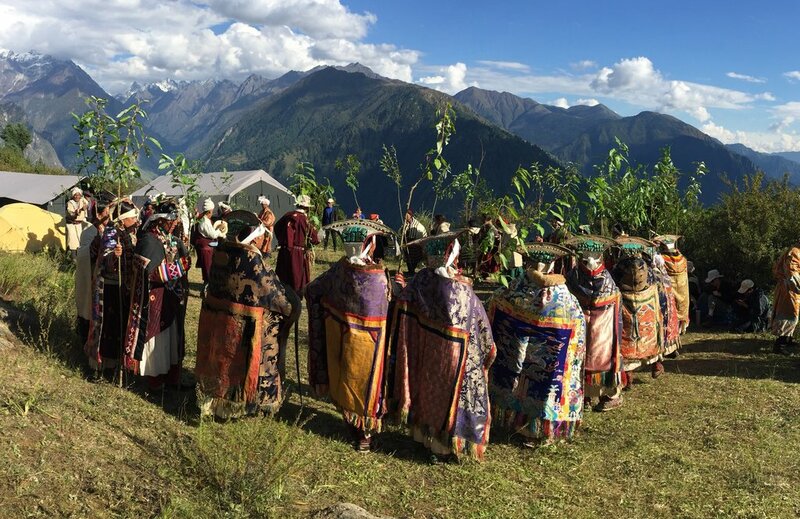 People from all over the valley gather in beautiful traditional dress. It's a great time to be traveling through the region. From Tokra it takes another 1.5-2 hours to reach the campsite just below Raling Gompa (12,893 ft. / 3,930 m.). 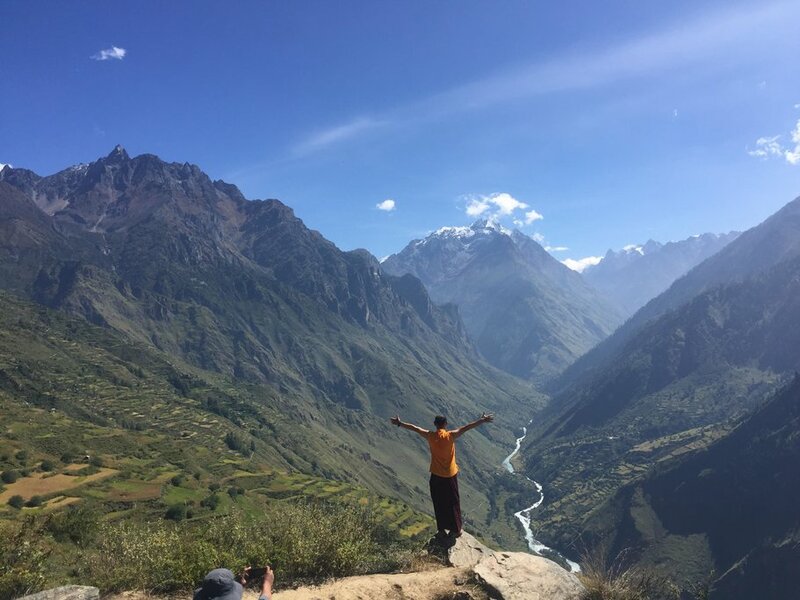 From the campsite you can see Raling Gompa located on a barren rock; behind is the beautiful Crystal Mountain. This is a truly spectacular sight. It takes about 20 minutes from the campsite to reach Raling Gompa. Raling Gompa belongs to the Nyingmapa Sect of Buddhism, the oldest sect within Tibetan Buddhism. Honor is paid to Guru Rinpoche (also called Padmasambhava), the famous guru who introduced Vajrayana Buddhism to Tibet and its neighboring countries in the 8th century. Upon arrival, follow the Tibetan tradition and walk a kora (circumambulation) around the monastery thrice before entering. Located next to the monastery is the famous Milarepa Cave, where yogi-poet Milarepa once meditated. Today, descend back to the iron bridge over the Ghatte Khola (approx. 2 hours), following the river downstream. After about 15 minutes, pass a junction and take the left fork to Bargaun (9,645 ft. / 2,940 m.). The trail goes high above the river once more. It is easy walking through juniper bushes and fields. After about 30 minutes, pass the settlement of Nimatang Gomba (10,449 ft. / 3,185 m.). Nimatang Gomba consists of only a few houses, inside one of which is a small gompa (Buddhist monastery). The trail continues high above the fields for a while. It takes about 1.5 hours to reach Bargaun, a charming village surrounded by fields, with a few homestays. It is mostly Buddhist, with some Hindu people living here too. Tonight, enjoy an interesting program of healing with a local Shaman. After a late breakfast of buckwheat pancakes with potato curry, proceed along a small trail going flat through terraced fields. Follow the lower routes and make a loop. After about three hours, reach Simikot, where you will be treated to some comforts again, like hot showers. 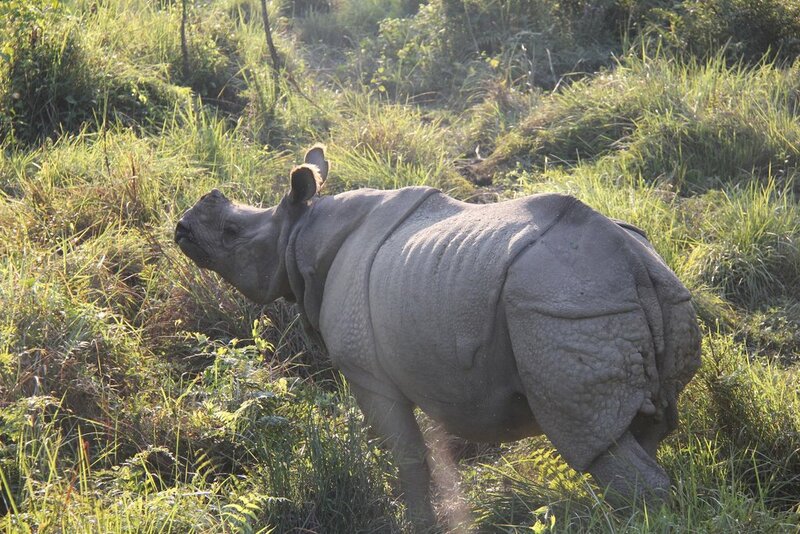 Fly south to Nepalgunj, then head west for two hours by vehicle to Bardia National Park (56 miles / 90 km.). Arrive in time for lunch at your jungle-style lodge. After lunch, take a tour of an authentic Tharu village. The Tharus are believed to be the original inhabitants of the local jungle area. In the evening, be treated to a traditional Tharu dance before dinner. Today, enjoy a full day of jungle safari activities. Take an elephant ride or Jeep safari—it's best to go early, when the morning mist rises over the river and grasslands and the wildlife go to the water to drink. Monkeys chatter and birds call from the trees. If you're lucky, you'll spot an elusive Royal Bengal Tiger. After lunch, take a jungle walk. It's another excellent opportunity to see wild animals and take some great photos. Make your way to the airstrip for your return journey to Kathmandu. In the afternoon, there will be some free time to visit other points of interest in the capital or do some last minute shopping. Enjoy free time in Kathmandu until your scheduled departure from the airport.